We tend to think of South Asia and the Middle East as separate strategic zones, each preoccupied with distinct problems. But they have been closely connected in history, and are becoming increasingly so once more. Pakistan has been resetting its relationship with historic allies in the Persian Gulf after rebuffing their call to join in the Yemen war in 2015. But India, having kept its distance, is now making inroads in the region too, deepening its relationship with Iran while breaking new ground with Arab powers. As American leadership in the Middle East wanes, and India wages a campaign to isolate Pakistan everywhere it can, both New Delhi and Islamabad will pay careful attention to the countries across the Arabian Sea. We can see evidence of this in the last few weeks alone. As General Raheel Sharif, then-Pakistan Army chief, neared the end of his tenure in November, rumours swirled that he might be asked to lead the 39-nation Islamic Military Alliance to Fight Terrorism (IMAFT) based in Riyadh. The group had been established by Saudi Arabia the previous year; Pakistani officials were taken by surprise at their country’s inclusion. On 6 January, Pakistan’s hapless defence minister, who had earlier responded to fake news by threatening to nuke Israel, confirmed that Sharif ‘has been made the captain of the Saudi alliance’ (there remains some confusion around this). Pakistan has always maintained extensive military-to-military ties with the Arab states. Pakistan assisted the Royal Saudi Air Force in building and piloting its first jet fighters in the 1960s, and Pakistani personnel flew Saudi aircraft during a Yemeni cross-border war in 1969. In subsequent decades, as many as 15,000 Pakistani troops were stationed on Saudi Arabia’s North-Western borders. In 1986, Pakistan’s footprint was reported to comprise one division, two armoured and two artillery brigades, along with naval and air force personnel. Pakistani forces made up much of the 12th Armoured Brigade, although it reportedly left in 1988 (some accounts say that Riyadh demanded Pakistan send only Sunni personnel, others that they were no longer affordable after the fall in oil prices). Today, Pakistan’s presence is smaller but still includes a squadron of pilots at the UAE’s Al Ain Airbase and two brigades in Saudi Arabia. In turn, the Gulf states have given significant financial assistance to Pakistan, as well as support within the Organisation of Islamic Cooperation (OIC) on Kashmir. Saudi Arabia has been particularly close to Prime Minister Nawaz Sharif, who was exiled there after being deposed in a coup in 1999. But as Saudi-Iran competition has expanded in scope and severity in recent years, many Pakistanis have chafed at what the perceived risks of being drawn into a hyper-sectarian conflict, jeopardising relations with their Iranian neighbour, and inviting undue influence from countries that have funded and supported hard-line Sunni Islamist groups in Pakistan. Though Sharif was a hugely popular figure (thanks both to his very real counter-terrorism successes and a concerted Army-led PR campaign), his appointment drew sharp criticism not only from Shia political groups but also mainstream political analysts. ‘We are not looking for any involvement outside our region,’ insisted the Pakistan Army’s spokesman in November. Sharif’s appointment, which would have had to be cleared by the army itself, if not the government, suggested otherwise. And on 20 January, Sharif’s successor, General Qamar Bajwa (whom I wrote about on the Interpreter a few weeks ago) ‘reassured the [Saudi] Ambassador that [the] Pakistan Army holds the defence of [Saudi Arabia] at par with its own’. This is a remarkable commitment, given the scale of Pakistan’s domestic and foreign defence challenges. But if Saudi Arabia has absolved Pakistan for its reticence over Yemen, others have been less forgiving. ‘The moment of truth distinguishes between the real ally and the ally of media and statements,’ declared an Emirati minister immediately after Pakistan’s parliament voted against involvement in 2015. Pakistan would pay a ‘heavy price’. This is perhaps one reason why, on 26 January, Mohammed bin Zayed bin Sultan Al-Nahyan, the Crown Prince of Abu Dhabi and the Deputy Supreme Commander of the UAE armed forces, watched the Indian military parade through New Delhi for the country’s Republic Day. Al-Nahyan, who was invited as chief guest, had been greeted at the airport, against protocol, by Prime Minister Narendra Modi himself. The Indian Express has described this visit as a ‘complete reset of India’s relationship with the Gulf’. That’s a bit strong, but it does point to something real. Last year, the UAE was India’s third-largest trading partner, its second-largest export destination, the tenth-largest investor, and the fifth-largest supplier of crude oil. India continues to be concerned by Pakistan-linked terrorists finding sanctuary in the Gulf, and the sensitivity of the issue can be seen in a recent interview where the UAE’s envoy in India repeatedly professed complete ignorance of the issue. But New Delhi was greatly encouraged by the UAE’s strongly supportive statement after an attack on Indian soldiers in Kashmir in September, which ultimately led to India’s retaliatory raid over the Line of Control (LoC) and the downward spiral in ties with Pakistan. That statement reinforced India-UAE joint statements in 2015 and 2016 that had both made pointed references to state sponsorship of sectarianism, extremism, and terrorism. This, of course, has very different connotations in each state, with India signalling to Pakistan, and the UAE mainly to Iran. Nevertheless, Indian officials have noted that ‘cooperation between India and UAE in intelligence sharing and counter terrorism is exceptional’ – such a statement would certainly not have been made a decade ago. The killing of five Emirati diplomats in Afghanistan, where Pakistan-backed groups have conducted numerous attacks (including against Indian diplomats) may accelerate this convergence. Progress in the defence relationship is also noteworthy. The UAE has repeatedly been associated with purchases of the joint Indo-Russian BrahMos cruise missile, and India views it as a major potential customer for future arms exports. Most significant of all, given the UAE’s longstanding ties to the Pakistan Air Force, would be Indian assistance to Emirati air defence systems and British-made Hawk jet trainers, on top of a ten-day air combat exercise that took place in May and June last year. India cannot replace Pakistan as a security provider in the Middle East. It has a different approach to foreign entanglements and alliances, does not have the same financial pressures driving its involvement, and has too much at stake in its relationship with Iran. But as defence exports, training, and exercises grow, and as intelligence cooperation expands, Pakistan’s traditional influence is likely to weaken. 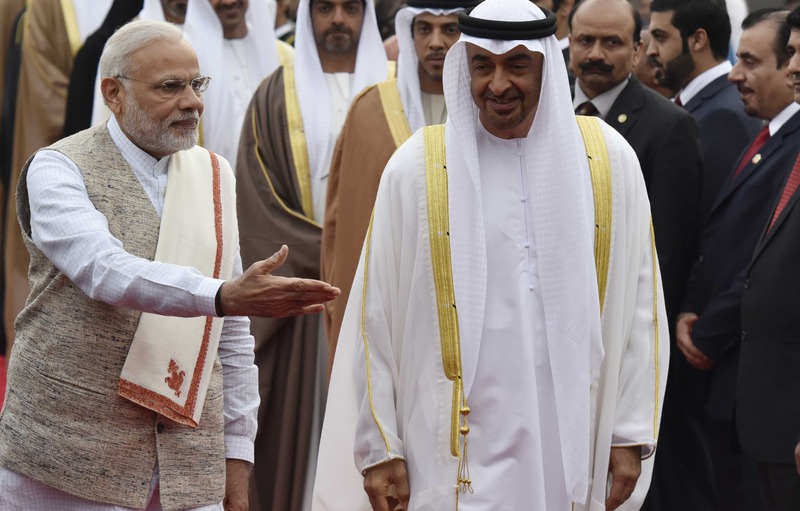 As Raja Mohan has written, ‘India’s current intensive engagement with the UAE is a test case for India’s credibility in the region’. Raheel Sharif’s prospective move to Riyadh may be a seen as a sign of hedging, but perhaps, as Christophe Jaffrelot has proposed, it’s also a substitute for a truly meaningful Pakistani military commitment. Pakistan once valorised its Arab and Islamic identity, but perhaps its weakening foothold in the Gulf will push it further still towards China.